Karen Hughes served the United States District Court for the Southern District of California as a law clerk for the Honorable William B. Enright for over twenty years. She was a brilliant attorney, and a principled and independent thinker. Ms. Hughes pursued a career in publishing before attending law school at UC Hastings College of the Law. Upon graduation in 1989, she served as Judge Enright’s term law clerk from September 11, 1989 to August 16, 1991. She then became a law secretary for the New Jersey Supreme Court from September 1, 1999 to August 31, 1992. Ms. Hughes returned to California as a staff attorney for the U.S. Court of Appeals in San Francisco on September 1, 1992. From September 11, 1995, to her death on October 27, 2016, Ms. Hughes served as Judge Enright's career law clerk. Ms. Hughes served on numerous committees and in various leadership roles within the District Court. She served on the Criminal Justice Memorial Committee. She spearheaded the effort to collect, edit, and publish articles about the founding of the Court, as 2016 was the Court’s 50th anniversary. Her efforts resulted in a collection of articles about the Court being published in Western Legal History, the Journal of the Ninth Judicial Circuit Historical Society. Volunteering was her passion. She worked with residents of the Polinsky Center, an emergency shelter for youth in crisis. She tutored refugee children. She spent weekend mornings sorting books at the San Diego Book Project, a not-for-profit that collects books through donations and finds homes for them. She volunteered with the San Diego Humane Society. She, along with colleagues at the Court, developed an educational mock trial video program that taught children about the components of a jury trial. The program became an officially sanctioned volunteer program of the Office of the Circuit Executive for the Ninth Circuit. Ms. Hughes also developed a curriculum to teach elementary school students peaceful conflict resolution skills. She trained students to be peer mediators. Ms. Hughes organized and participated in reading groups that visited Porter Elementary, a school in southeast San Diego. Ms. Hughes’ dedication to serving others inspired everyone she met, including her colleagues at the Court. She was instrumental in the Court’s community outreach programs. 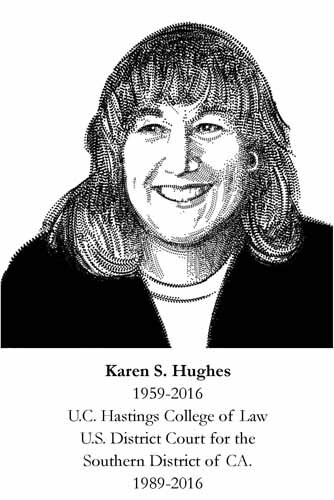 Karen Hughes has made a lasting impact on the members of the San Diego legal community through her professionalism, her integrity, and her generosity of spirit.